Growth in the number of connected Devices at a phenomenal volume and rate. Cloud based systems and applications that act as centralized systems for these devices. Big data and Analytics to provide meaningful insights based on the data collected from the interconnected devices. Improved efficiency, smarter systems for supply chain management, business growth with mobile workforce and hidden revenue streams from data analytics. 1. Infrastructure and key business areas. Focus on the key areas of your business that can generate a quick return on investment. Identify your infrastructure requirements for logistics, inventory, maintenance and operational efficiencies of your organisation. 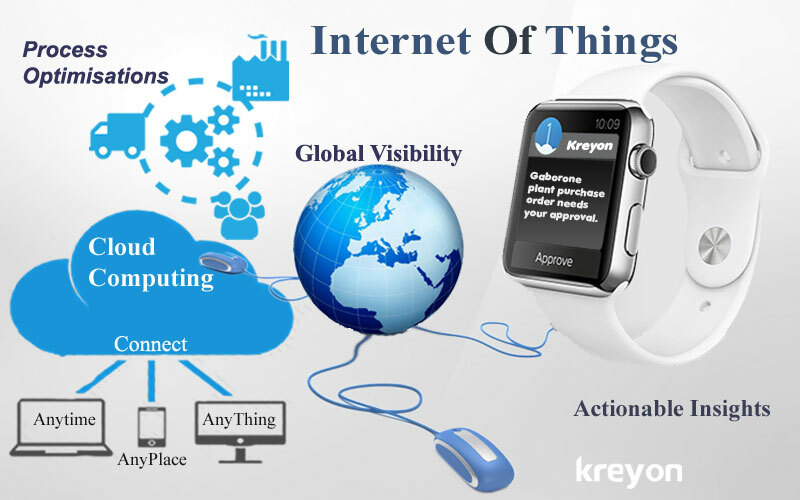 An IoT is a great ecosystem to interconnect all these and make you connect systems, develop better visibility of your business performance. It can also reduce downtime, reduce predictive costs and increase operational efficiencies for your existing systems. With IoT, all the existing assets of an organisation can be tagged. The tagged assets can be connected to a centralized system where they be monitored proactively. The sensor devices communicate with the centralized system through signals sent through network protocols. The real time status of the assets is also available on the centralized system. This improves an organisation to track where its assets are located and makes them effectively utilize them. 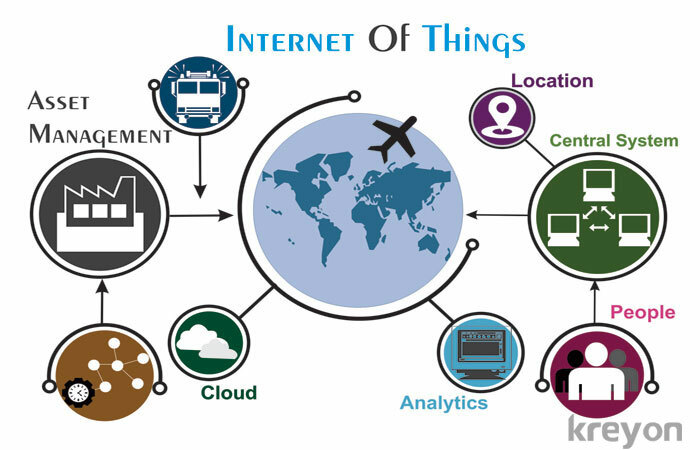 IoT enables an interconnected system to connect devices, people and processes. The communication can be improved with sensor data and proactive monitoring of the systems. The processes are triggered by insights from the data, for e.g. maintenance may be scheduled by actual usage log of the machine. It will minimize human intervention and make the processes more efficient. Many experts believe that by 2018, the total cost of the business owners will drop around 30% through the help of smart machines and other industrialized services. Internet of things can help organisations to reduce manpower, automate tasks, increase operational efficiencies, asset utilisation and downtime leading to increased cost savings. The fleet management operations can be efficiently managed with IoT. All the vehicles of a company may be tagged with realtime trackers and sensors. The status of the vehicles is visible on the centralized system. The realtime status, location and movement of the vehicles can be tracked with IoT. The critical parameters like fuel, oil, temperature and other diagnostics can also be tracked realtime. The IoT enabled manufacturing creates smart systems to develop products rapidly. The key processes for manufacturing are enabled with intelligent sensor devices for optimized work flow. The process controls, tools, services, safety regulations and measurements can be designed to improve reliability of processes and improve manufacturing for companies. The IoT enables you to connect multiple lines of business, people and processes to a centralized system. The manufacturing, supply chain management, people time sheets and attendance, fleet management and several other areas can be integrated with IoT. An integrated platform enables better tracking, improved responsiveness and better decisions. Data is a central part of the IoT. The data is collected from all the devices through the sensors. Most of the organisations are learning and adapting to survive in the industry. They can monitor and analyze useful data from different sources and enable their business to change in a proactive way. With the help of IoT services, you will be able to apply necessary historical data to make predictive assessments for your future of your business. The insights from the data are used to trigger decisions for better business outcomes. The data captured from the IoT devices can be used for creating effective and targeted marketing campaigns. The behavioral trends of the users are analyzed for creating contextual display advertising based on usage patterns and interests. The location, buying patterns and interests of the users are used for creating targeted & effective marketing campaigns. Devices and mobiles are now the mainstream touch points driving revenue and business. The IoT is a step to empower and transform your business. The agility, process improvements, operational efficiencies, and data analysis can help you uncover hidden potential and business opportunities. Selecting the right partner for implementation is one of the key decisions. The IoT partner must be able to customize, create custom solutions for maximum impact and ROI for your business. The organisations around the world are sizing up the opportunities and benefits from IoT. The sheer scale and rapidly growing technological advancements in this space cannot be ignored. A proactive approach will help companies to ride on this wave of technological revolution and surge ahead of their competitors. Companies like Procter & Gamble, Walmart and several others have adopted smart IoT systems to improve their supply chain methodology. They have benefitted immensely with realtime inventory, better health status of their machines with predictive monitoring, improved up-time for machines, develop new business models, proactive and better customer service.